A bag of wilted greens. Well, yes, other things make me sad too. But wilted greens – they just look so pathetic. There they are, once vibrant with color with crispy leaves standing tall just asking for attention. And then something happens, life drained out of them, looking drab and lifeless. Sigh. So what do you do? Maybe there are a few good ones left. Do you pick through and try to save what you can? Well, sure you can do that. But you know what I do? Make pesto! Pesto is my way of reviving those pathetic greens. You may be familiar with pesto – pesto alla genovese – the kind made with fresh basil and pine nuts. While delicious, pesto is really just a term that means pound or crush, mainly with a mortar and pestle, and can be made with any combination of herbs or nuts. In this case, I brought my wilted arugula back to life. What? Not familiar with arugula? Understandable. Arugula wasn’t commonly used in the US until about 35 years ago and even then it was only popular in trendy restaurants. Now it can be found in almost all super markets. Arugula is a peppery-flavored green, even sometimes a little spicy. Also called rocket, it actually originates from Italy. 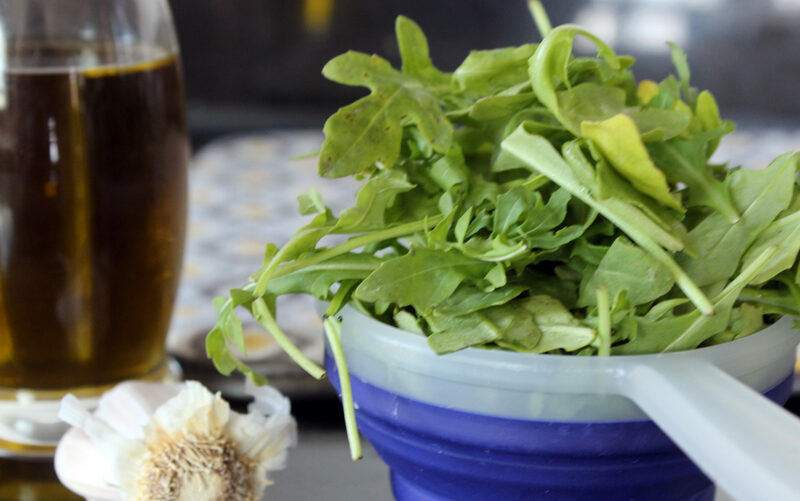 Arugula is great as a simple salad or even added to pasta dishes and soups. And this may surprise you – although arugula looks like a type of green, it’s actually a cruciferous vegetable. You know what that means – it joins the ranks with cabbage sprouts to potentially help prevent cancer. My arugula pesto is made with walnuts and lots of lemon – juice, pulp and peel. I like walnuts because of their amazing health benefits and, quite honestly, they’re a lot less expensive than pine nuts. And the lemon? That extra lemony punch really complements the flavor of arugula. So next time you find yourself facing a bunch of wilted greens, don’t be sad – make pesto! Not sure what to do with pesto? Never fear ! Not only can you add it to pasta but top a homemade pizza or make it a bruschetta topping or spread it on a sandwich. Possibilities are endless! Add arugula, walnuts, garlic, parsley, red pepper flakes to food processor. Using a microplane, grated peel of both lemons into food processor. Process until forms a paste, slowly add olive oil and the juice and pulp of the lemons while machine is running. Process until well blended. With machine stopped, add salt and pepper to taste. If mixture is too thick, you can add more olive oil or warm water. Add grated parmesan. Keep in air tight container in the refrigerator. To keep the pesto fresh, top off with olive oil before storing.